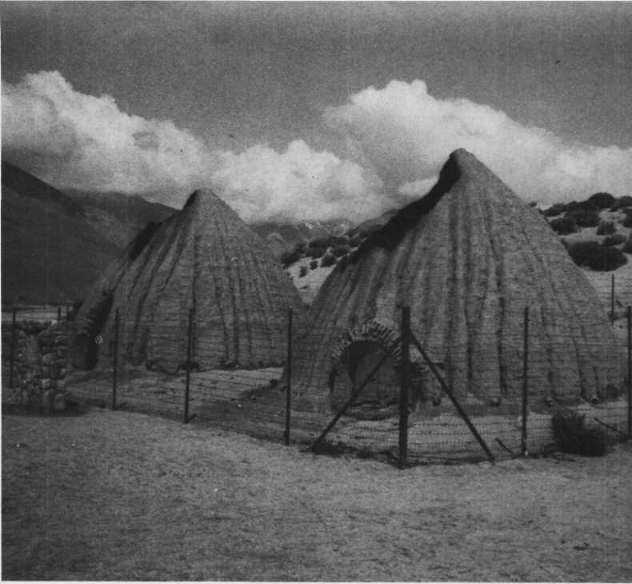 charcoal kilns (below), can still be photographed only a mile from U.S. 395. In 1872, THE steamship Bessie Brady began her maiden voyage. It was the start of a service that would last years within sight of Mt. Whitney, the highest mountain in the continental United States. The steamship navigated a lake that hardly exists today. She carried a cargo of charcoal from kilns now decaying in towns that do not appear on most modern maps. The Cerro Gordo mines, high in California's Inyo Mountains, were operating at full capacity in 1870. The silver-lead ore was conveyed down the rugged mountain by cable and bucket to smelters at Swansea and Keeler on the eastern shore of Owens Lake. At that time, before the Los Angeles Aqueduct had been built, Owens Lake was full to the brim from the abundant waters of the Owens River. The sparse forests of the Inyos were soon stripped of its pinion and juniper trees to feed the hungry smelters, but across Owens Lake in the Sierra Nevada Mountains, there was an endless supply of fuel. On the eastern slope of the Sierras at Cottonwood creek, a sawmill was built. Trees were cut into small blocks of wood which were sent streaming down a giant flume to the western shore of the lake where newly-constructed adobe kilns awaited them. 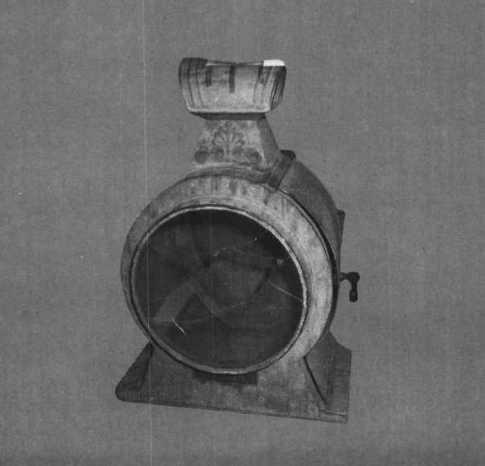 The kilns turned the wood into charcoal and the first cargo of the Bessie Brady was ready for shipment. 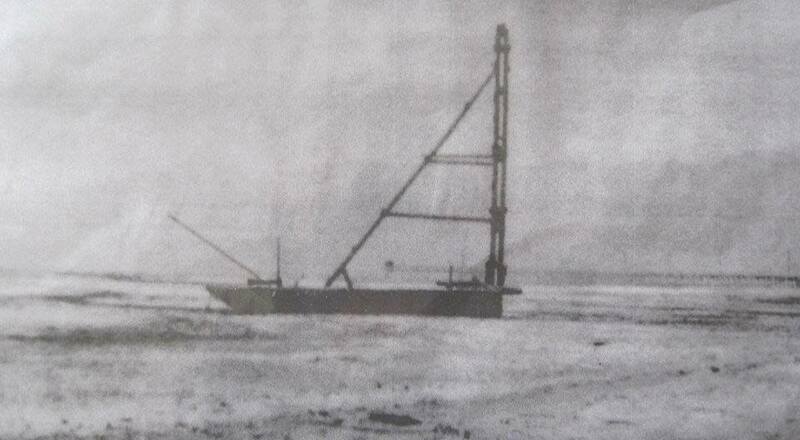 The charcoal was delivered across the lake to the smelters and, on the return trip she carried the silver-lead ingots to the docks of Cartago at the southern end of Owens Lake. 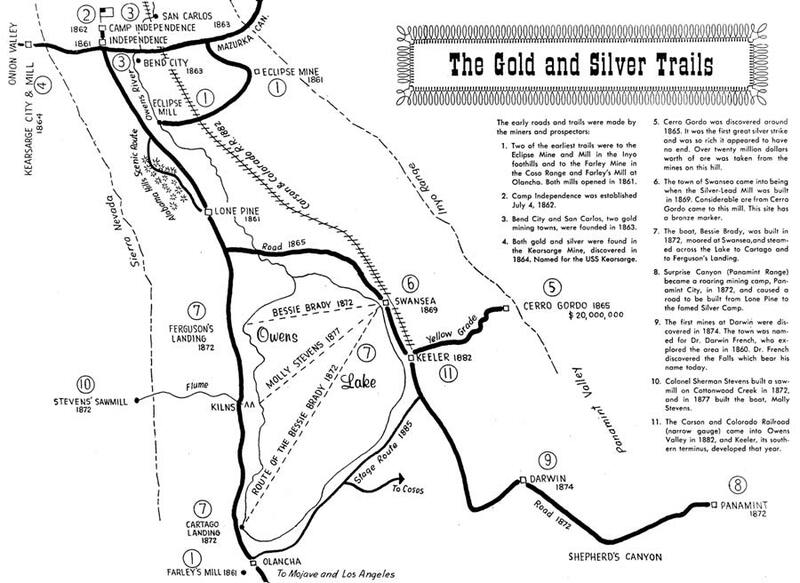 From Cartago, the ingots were freighted 200 miles by wagon to Los Angeles. 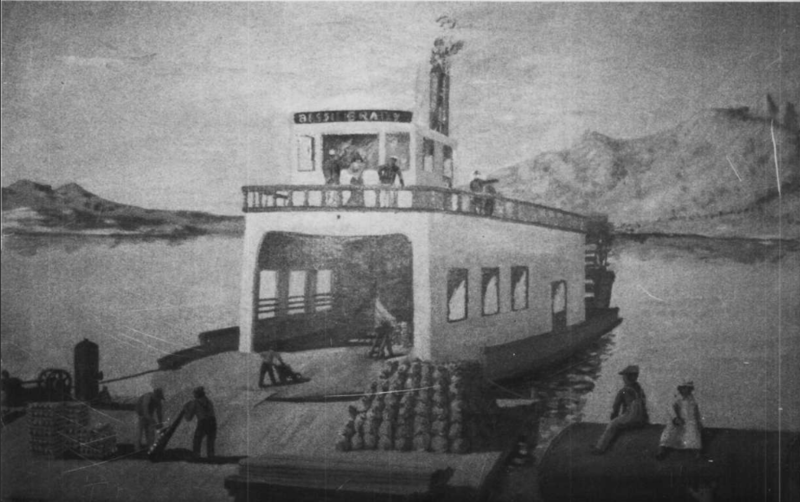 For the next few years, the steamship followed the route, enjoying the boom of the Cerro Gordo mines. By 1880, it was all over. The Cerro Gordo mines were empty and the smelters turned cold. The charcoal kilns were decaying and the log stockpile lay dead in the Sierra Nevada. Below the snow-capped peak of Mt. Whitney, the Bessie Brady disappeared from the lake whose blue waters would one day become a dry salt flat. Although the Bessie Brady is gone, her history and that of Owens Lake, the Cerro Gordo mines, and the sawmill at Cottonwood Creek hasn't died. Their history can be relived by visiting the places that link them together. The decaying charcoal kilns which sit like giant bee hives in the desert can be seen on the west side of the lake. Turn off U.S. 395 at the sign just north of Cartago and drive a short distance to the east. A short walk beyond the kilns will take you to the marshy and salt-crusted shore of the lake . It was here the steamer was loaded with charcoal and lumber for her trip across the lake to the smelters at Swansea and Keeler. With a little imagination as you look at the few remaining piers you can see the little stern-wheeler being loaded. At the open bow cargo is being carried into the 6-foot-deep hold above the main deck. A glassed-in pilot house stands above the hold and provides a full-length view of the steamer from bow to paddle wheel. She is 85 feet long and 16 feet wide with a carrying capacity of 100 tons. Around the lake to the eastern shores on State 190 the town of Swansea has disappeared into the past and only the ruins of the old silver and lead smelter remain. The decaying brick furnace and few scraps of metal are preserved for visitors who want to look into the colorful past of Owens Valley. There is no evidence of that day in July 1874 when a cloudburst Cerro Gordo and the water rushed down the mountain toward Swansea. The fire in the furnace was drowned and thousands of cords of wood and tons of charcoal were washed out on the plain between the town and the lake. South of the site of Swansea, the town of Keeler still stands, faded to a small mining community on the shore of Owens Lake where the steamship at one time was loaded with her precious cargo. Above Keeler a dirt road twists its way up to the Cerro Gordo mines. Ore buckets suspended on rusty cables can still be found along the old road. Back across the lake another road into history leads up Cottonwood Creek into the Sierras toward the site of the old sawmill. A short hike at the end of the road is required to view what's left of the mill the cabins the wooden flume and the uncut logs A tragic loss occurred a few years ago. when fire destroyed the wooden framework of the sawmill. Cartago on the south end of the lake still lives today its a small ranch town. Near it with permission from the property owners: visitors can see the stone piers Of the wharf where the silver-lead ingots were unloaded from the lake steamer for shipment to Los Angeles. The final leg of reliving the history of the steamer is the museum at Independence. In it the story of the Cerro Gordo mines can he seen. 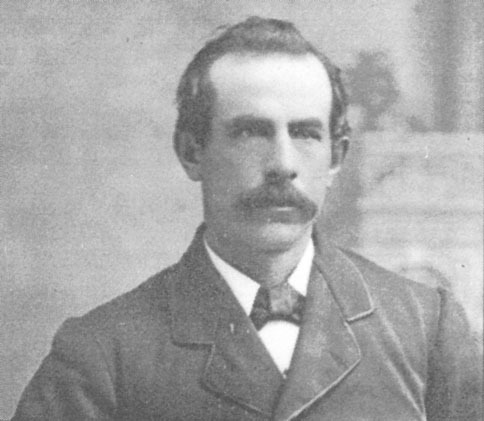 Pictures and relics of the early pioneers of Owens Valley are preserved. And also preserved is the last remnant of the lake steamer the light that shone its beacon over the dark waters of Owens Lake where the Bessie Brady I cruised her way into history. Owens Valley visit pages 43, 44 and 44a of this site. Manzanar Internment Camp Portraits, History etc.